Democratic presidential candidate Bernie Sanders has carried his populist message of economic inequality to the Vatican. Visiting to speak at an economy and social justice conference, he emphasised "the common good". There are no plans for him to meet personally with Pope Francis. "I'm so excited and proud to be here with other people who are trying to create a moral economy," he told supporters outside the Vatican. He said the world must direct "our efforts and vision to the common" and praised the Catholic Church's teachings on the economy. The visit comes just four days before a crucial state primary contest in his native New York. On Thursday night, the Vermont senator and his rival Hillary Clinton clashed on Wall Street banks, gun controls and the minimum wage in a punchy debate. Image caption Sanders Supporters played on Mr Sanders campaign slogan "Feeling the Bern"
Afterwards he flew to Rome, where supporters were gathered at the Vatican wearing T-shirts saying: "Rome feels the Bern." Mr Sanders said inequality, injustice and pollution are causing "devastating" problems. And he admires the pope for his views on income inequality and greed. Some political commentators have wondered why he would travel to Rome so close to the New York primary. "It's a real misstep," New York Times columnist Charles Blow said on CNN. "He's basically going to be saying the same thing there that he's been saying here." Mr Sanders' campaign manager Jeff Weaver defended the trip at a rally. "Hillary Clinton has been out of the state on a number of occasions for high-dollar fundraisers," he said. "We think this is a more important reason to leave the campaign trail for the day." 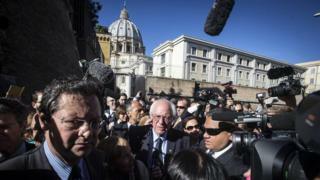 Mr Sanders defended the trip to reporters and supporters outside of the Vatican. "I know that it's taking me away from the campaign trail for a day but when I received this information it was so moving to me that it was something that I could just simply not refuse to attend," he said. "Our youth are no longer satisfied with corrupt and broken politics and an economy of stark inequality and injustice," Mr Sanders said outside of the Vatican. Youth want a "return to fairness" and assurance that everyone has access to health care, nutrition and education. Pope Francis preached a similar message of economic fairness and compassion for the poor when visiting the US this summer and addressing Congress. Mr Trump called his comments "disgraceful". He clashed with Republican front-runner Donald Trump in February, questioning his Christianity over his call to build a border wall with Mexico. Mrs Clinton, who represented the state in US Senate for two terms, holds a commanding lead in New York, according to recent polls. Mr Sanders plans on releasing his tax returns soon, he said at the debate, and that his wife Jane is in charge of taxes. "We'll get our tax returns out. We've been busy; you might have noticed," he said.